Now lets look at the Type of the object. 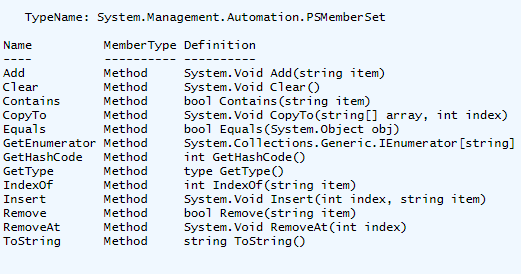 As you can see, the object type is System.Management.Automation.PSCustomObject which is a default type when creating a custom object using the New-Object PSObject method. The only one that I will be talking about here is the pstypenames code property. The types in the collection are in an inheritance order, meaning that the PSCustomObject would be first in line for any type formatting that is specified in an PS1XML file. 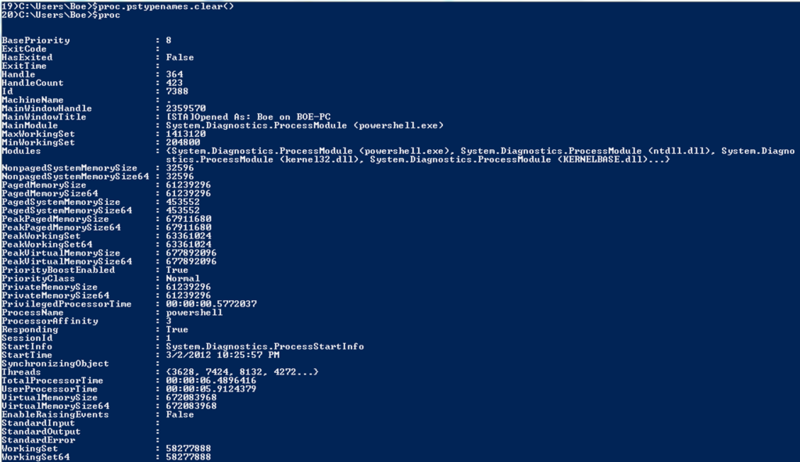 A better example would be to look at the pstypenames collection from a process object. In this example, the System.Diagnostics.Process type is at the top of the inheritance chain, thus why you see the specific output when viewing the properties of the $proc variable via Format-List and Format-Table (default view). Back to working with the pstypename code property. For fun, lets clear out the typenames for the process and see what happens. Now that is a lot of information. Not exactly what you are used to seeing as a default view for processes. This is because we have removed all types associated with this object. Now this only applies to this specific object, if I were to run Get-Process again, the results would be back to the normal view we are used to seeing. Lets use the Add() method to add a custom type to my custom object now. How can we overcome this? Simple, we can use the Insert() method and specify the top of the stack to place our custom type on. Looking at the object using Get-Member, we will also see that my type I inserted is now considered to be the main type on this object. That looks a lot better now. If we were using a format file against this type name, it would apply to this object based on what we defined in the file. So far you have seen me use New-Object with a hash table to create a custom object and set up the custom type names, but that doesn’t mean it is the only way to accomplish this. You can also use Select-Object to set up a custom object and still set a custom type on it as well. Currently, it is being registered as a string, which is not too exciting by any means. We can easily switch that up to something a little better. We have now updated the type of this object to something other than being a string. The last thing to remember is just because to update the type of an object, it does not become the object. For example, I cannot turn this into a hashtable magically with all of the associated methods. Looks like it might be a hashtable looking at the typename, but the methods do not lie. This is not what it claims to be. So there you go! You can now get started on creating your own objects and adding your own custom object types! 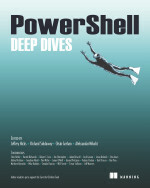 This entry was posted in powershell and tagged custom objects, custom types, Powershell, pstypename. Bookmark the permalink.